Yes, you read correctly! This recipe for Healthy Dark Chocolate Chip Zucchini Muffins can still be considered healthy – even though the recipe includes chocolate chips. Once you read the list of ingredients, you will quickly understand why. I have also provided you with some suggestions so that you can modify some of your favorite muffin recipes to make them healthier, without comprising on the taste… at least that’s the goal! As a dietitian, I am often asked about what makes a recipe healthy. Specific to muffin recipes, I would like to share the process that I go through when attempting to improve the nutritional value of a muffin. The overall goal is to gradually reduce the amount of total sugar and the amount and type of fat. Increasing the fiber content of a muffin recipe is always a bonus. Once you get the hang of making changes to your muffin recipes, you will quickly appreciate the flavor of the muffin instead of an overpowering “sweetness”. And remember, whatever changes you make to your original muffin recipe will bring you that much closer to adapting a healthier lifestyle for you and your family. I would encourage you to make one change at a time. This way each change can properly be evaluated. Size matters: Before we start analyzing the list of ingredients, we need to look at the size of your muffin. Portion sizes of certain foods have gotten a little bit out of control. Did you know that according to this resource, a Kirkland chocolate muffin (sold at Costco bakeries) has 689 calories and provides you with a generous 38 grams of fat? Don’t get me wrong… I love Costco… But just think of all the spinning you need to do before you burn off those calories, and all from one muffin! With that being said, if you are trying to reduce your portion sizes, why not invest in a mini muffin tin, or maybe stretch out your muffin recipe to make more than the usual 12 muffins. Include dark chocolate: Studies have indicated that consuming dark chocolate, in small amounts, can actually be healthy. But what exactly is a small amount? Most studies will state that one small square of a chocolate bar, 2-3 times per week, is all you need. For those of you that prefer to weigh, that’s about 6 grams. So, whenever I am making muffins, I will usually throw in a small handful of dark chocolate chips like I did for these moist banana muffins, the best chocolate muffins, and this easy pumpkin muffin recipe. I would like to remind you that your little square of chocolate should contain at least 70% cocoa, with the least amount of processing; same for chocolate chips. Ideally, you should try to get organic. This will provide you with the most benefits when we are referring to the levels of flavenols. These are powerful anti-oxidants that may help neutralize free radicals. Just a spoonful of sugar: It may help the medicine go down, but do we really need so much sugar? You’ll notice that if you reduce the total amount of sugar in a muffin recipe, no one will really detect the change. So let’s say that your recipe calls for 1 cup of white granulated sugar. Experiment by reducing the amount anywhere between ¼ – ½ of a cup, and adjust until you get a great tasting product. I will often replace the white sugar with either brown sugar or even honey. And remember, you can always add a handful of fresh or dried fruit – this will increase the natural sweetness of your muffin and the fiber content. You won’t even notice you’ve cut down on the sugar. Substitute the fat: You can easily replace butter and shortening in any muffin recipe with a healthier fat such as canola, olive oil or even corn oil. These poly and mono-unsaturated oils are definitely a healthier choice. The goal is to replace the butter or shortening because they contribute to the total amount of saturated fats. As an example, let’s say that you have a muffin recipe which calls for 1 stick of butter (½ cup). I would replace that with ½ cup of canola oil minus 2 tablespoons, since there is water in butter. I have also gotten great results by replacing some of the fat with applesauce or avocado. Once again, you need to do a little bit of experimenting in order to get a great tasting muffin. I am in the process of revising some of my favorite muffin recipes in order to make them a little healthier. Will definitely be sharing with all of you so stay tuned! Whole milk can also be a source of saturated fats. If you have a recipe which calls for whole milk, it can easily be replaced by a low-fat buttermilk or Greek yogurt. If you are interested, these Lemony Greek Yogurt Muffins are a wonderful way to incorporate some Greek yogurt. Increase the fiber: One way to increase the fiber content of your muffin is to replace some of the all-purpose flour with whole wheat flour. You can usually get away with replacing up to half of the amount without any noticeable changes in texture or taste. Remember, dried or fresh fruits make the perfect addition in muffins. These add-ins will provide you with fiber and allow you to reduce the total sugar found in your muffin recipe. Addition of vegetables: Zucchini, carrots, beets, pumpkin, sweet potato (to name but a few) can all be incorporated in muffins. This is a great way to sneak in some vegetables for the little ones that are fussy about their veggies. So there you have it! So many options to make any muffin recipe “healthier”. Experiment and incorporate whatever changes might work for you and your family. You won’t believe how easy it is to make your favorite muffin recipe a little bit healthier! 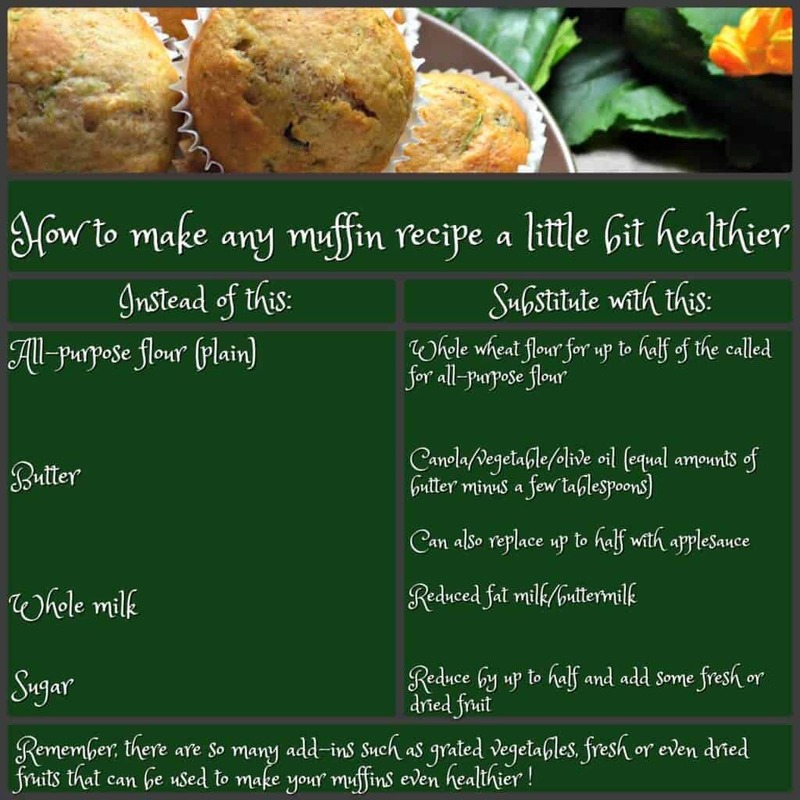 I’ve created a little chart that you can use as a guideline to make healthy muffins. As with any muffin recipe, we will combine the liquid ingredients in one bowl and the dry ingredients in another. Then it is just a question of combining the two together and gently incorporating the zucchini and the chocolate chips. This muffin recipe will make 18 regular sized muffins which freeze really well. I adapted the recipe for these Healthy Dark Chocolate Chip Zucchini Muffins from the Dairy Farmers of Canada. These are some of the changes I made: I played around with the spices to suit my personal preferences; I modified the amount of whole wheat and white flour; I used canola oil; and I replaced the milk with buttermilk. What better way to use up that surplus of zucchini! Celebrate nature’s bounty with this recipe for these Healthy Dark Chocolate Chip Zucchini Muffins. PS: Have you made this recipe? If you have made this recipe for zucchini muffins with chocolate chips, I would love to hear about it in the comments below and be sure to rate the recipe! Thanks so much for following and being part of the She loves biscotti community. Let’s make some new food memories! 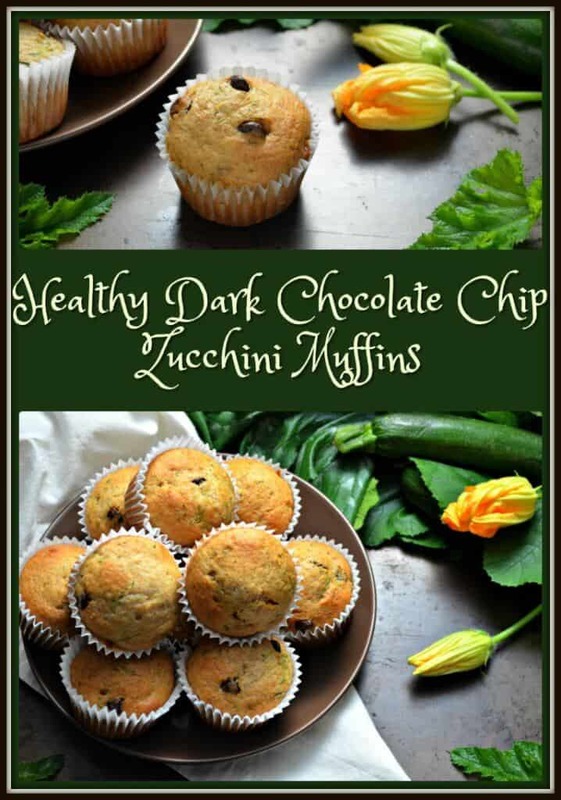 An easy and tasty recipe for healthy dark chocolate chip zucchini muffins, plus tips on how to make any muffin recipe healthier. Preheat the oven to 375℉/190℃. Position rack to middle. Paper line 18 muffin cups. In a large mixing bowl, whisk together both flours, baking powder, baking soda,and spices. In a separate bowl, whisk together egg, buttermilk, honey, oil, lemon juice and zest. Add liquid mixture all at once to the dry ingredients. Stir just until moistened. Gently fold in the zucchini and chocolate chips. Fill muffin liners ¾ full. Bake for 20-25 minutes or until top bounces back when lightly touched. IF YOU ENJOYED THIS ZUCCHINI MUFFIN RECIPE, SAVE IT FOR LATER. PIN IT TO YOUR MUFFIN BOARD! Loved, loved reading your post! I agree on so many levels! Portions, fats, sugars can easily be monitored and reduced. Your muffins look lovely, I’ll make them as soon as I have some zucchini from my in-law’s garden on hand. Thanks for all your tips! Pinned! What great tips on making muffins and co. healthier – I really enjoy reading infomative post like this and those muffins look great! I can’t bring myself to eat prepackaged muffins because of how bad they are for you! If I’m going to have splurge calories- give me something decadent! This looks fabulous- I wouldn’t feel bad about eating it for breakfast. Yum! I am thrilled to discover your post. Hi Lisa, thanks for dropping in! Maria – I was just yesterday thinking that I needed to make my Morning Glory Muffin recipe a bit healthier. I love the quick reference guide on how to accomplish that. Great job. Thanks. Loove zucchini in baked goods (called courgette on this side of the pond!) It just adds such great texture without making it taste too vegetable-y. Also, dark chocolate all the way, I always find it matches even better with baked goods as it’s got a richer flavour and doesn’t get lost. So yum! Thanks Jovina! Appreciate you coming by.